Basked in the newlywed’s glow, Joyce Tang (滕麗名) and her husband Matthew Chu (朱建崑) returned from their Thailand wedding looking as blissful as ever. The couple did not hesitate to show off their love, and joyfully revealed plans for a long honeymoon. Despite her unhappy past with former flames Marco Ngai (魏駿傑) and Derek Kwok (郭政鴻), Joyce remained hopeful and learned to take charge of her own love life. She finally found the right man in Canon executive Matthew Chu, and they began dating in 2011. The two maintained a loving relationship for two years, and often traveled together and showered each other with lavish presents. When Matthew was caught kissing his other girlfriend, Joyce continued to stand by his side, being extra attentive in order to win him back. Her efforts worked. Matthew allegedly broke up with his girlfriend soon after, and proposed to Joyce earlier this year. The two were married in an intimate beach ceremony on December 7. 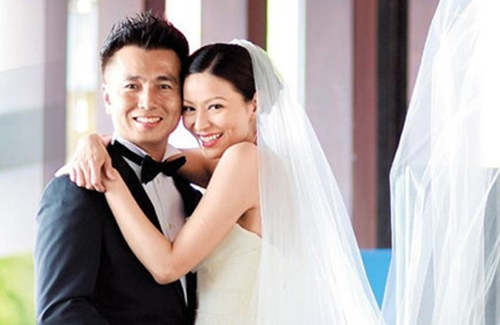 Although the wedding was simple, Joyce kept a smile on her face throughout the day and continued to do so as the couple returns to Hong Kong three days later. With her arms wrapped around her husband’s, Joyce looked completely smitten and unable to contain her happiness. She became bashful when reporters addressed her as “Mrs. Chu”, leaning closer to Matthew as he fielded most of the questions. The two currently have no plans to hold a banquet in Hong Kong, and will let nature take its course when it comes to having children. Although Joyce will continue her acting career after marriage, for now, her mind is occupied by honeymoon plans. She teasingly reminded her husband that he has promised to take her “up to the Heavens and down to the seas”, sharing that they will go skiing, diving, and sightseeing over three separate vacations. Aww~ they both looks so adorable and super happy together in the video clip! So happy for them! Matthew Chu, Joyce Tang’s husband, looks very handsome. They are well-matched. Wow ! both so good looking; will produce beautiful babies congrats them ! Indeed they will produce beautiful babies, like they said they’re not exactly going to try to conceive a life, if it happens it happens (that’s their approach). Children for them is not something that is out-ruled, but if they’re not able to conceive naturally (no fertility specialists, no traditional medicine or assisted reproduction treatments), they’ll leave it at that. Don’t expect every newlywed or even on the verge of being wed couples to have family planning on the table, like Roger Kwok. It’s the same case with Power & Mimi, as their daughter wasn’t exactly planned. She looks so happy, glad for her, she deserves it. Eat your heart out Marco!